Next J88PT will take place in Taipei from March 29th to April 3rd. It’s time to get a seat for J88PT Main Event NTD 5,000,000 GTD now, if you play in our online Satellites. There are three ways to do it online. The first one is the fastest — just play in [J88PT Taiwan Satellite]. It runs every Sunday at 20:30 (CST). The guarantee is one ticket to the J88PT Main Event. The Buy-in is ₵9,000 crystals. But if you have more time you can get it cheaper. We’ve also scheduled [J88PT Taiwan Qualifier] for you. They run every day, at 20:30(CST) Monday to Saturday and twice on Sunday at 17:45 (CST) and 18:30 (CST). The buy-in is ₵1,100 crystals. And the last way is actually FREE! But it will take you more time, of course. 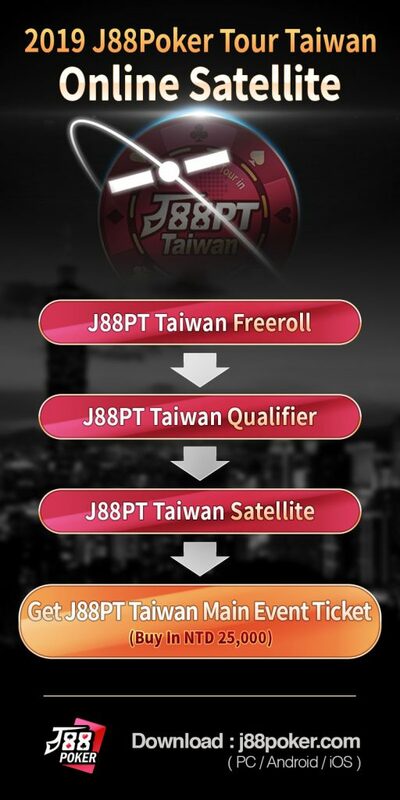 Just start your journey with [J88PT Taiwan Freeroll], three ₵1,100 tickets for J88PT Taiwan Qualifier are guaranteed. These Freerolls are held every day at 19:30 (CST) Monday to Saturday and at 16:00 (CST) on Sunday.